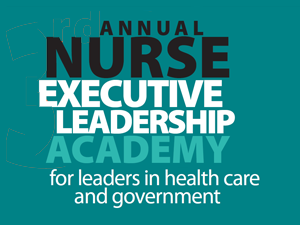 The 5th Annual Nurse Executive Leadership Academy is an energizing knowledge exchange forum for nurse executives from ALL sectors, including public health, primary care, hospitals, home care and long-term care. It aims to enhance leadership and governance knowledge and expertise among executive nurse leaders building on themes of health system transformation, values based leadership, evidence-based practice and effective stewardship. The Academy offers an inspiring leadership knowledge festival for nurse executives through opportunities to share current and emerging challenges, dialogue across sectors, hear multiple points of view and engage in dynamic discourse. Participants will gain novel insights and scientific and experiential knowledge to enact governance, leadership and practice roles based on a comprehensive system perspective. The program will feature expert faculty from policy, practice and academic settings, providing up-to-date insights for bolstering knowledge and competence in governance, policy formulation, evidence-based accountability and leadership.